All of this blogging is starting to cause a few headaches! Luckily we have paracetamol on hand to help out. Understanding crystal structure is a vital part of every aspect of drug design, from finding out how they interact in our bodies to how they pack into the pills we need to take. Hence it’s a requirement that before a drug goes onto our shelves that its crystal structure is fully understood. Crystal structure can help us understand many physical properties of a material, and one very relevant to the drug industry is solubility. An insoluble drug is useless as our bodies can’t break it down and use it. This can get a bit complicated if the drug in question can form more than one type of crystal structure, and paracetamol is no exception to this. There are, in fact, three forms (or polymorphs) of paracetamol. Forms I and II have been known about for quite a long time, but Form III was only fully understood in 2008 and is the structure featured here. 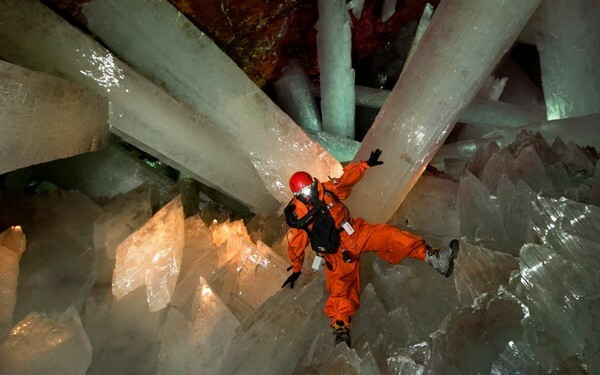 To found this out the researchers had to combine powder diffraction with state-of-the-art crystal structure prediction. In this structure the paracetamol molecule layer up, but are tilted slightly compared to the other forms. Form III of paracetamol was worked out by Perrin et al. in 2008. Spot the helix! Drawn using Jmol. since been extensively studied by X-ray and neutron diffraction. Dave Turner, tells us about some of the crystal structure’s he’s been working on. My imagination for finding vaguely amusing molecules, or ones with an amusing back story, has temporarily deserted me. In times of need there is only one truly reliable person to turn to. That’s right, today I’m posting my own work for the first time! My group has recently been interested in using dicarboxylates to make polymeric structures by forming bridges between metal atoms, giving a type of material known as a coordination polymer. In this specific example, we form chains that contain rings which are bridged by another organic group, bipyridine (see picture, left). The size of the ring is ideal for a bipyridine to pass through and the chemical nature of these groups means that it is favourable for it to do so. The structure is able to satisfy this inclusion by having chains that run at angles to each other and pass through each other. The middle picture shows four chains, with the bipyridine of one passing through the ring of another. As these chains run the length of the crystal, overall we see a complicated arrangement with each chain passing through, or being threaded by, many others (see picture, right). An arrangement where a molecular thread passes through a molecular ring is known as a rotaxane, with this example being a polyrotaxane. We make these types of structures to try and control the manner in which molecules assemble in the solid state. Unbelievably we were actually trying to get something similar to this when we carried out the reaction. 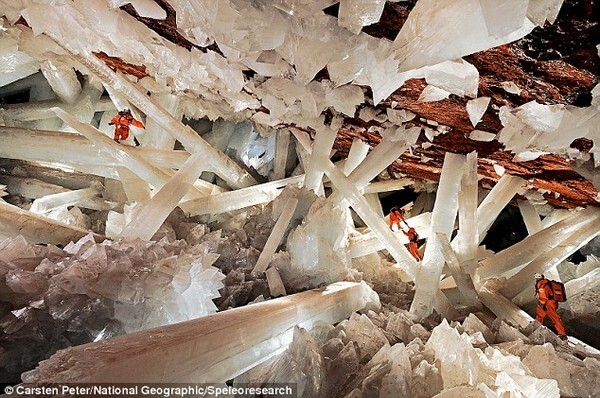 These structures always make me think about crystal formation. For crystals made from simple molecules it is easy to envisage the identical molecules packing on top of each other, like playing Tetris with only one type of block (and yes, that’s a time-wasting hyperlink for you). In these complicated structures that have rings being threaded through each other, the process is much harder to imagine and it is impressive that such arrangements can form. We published this structure earlier this year, alongside related examples of interlocked chains that form polycatenated structures. The work appeared in Chemical Communications, and was the work of a final year undergraduate in my research group. A membrane is the biological structure that forms the barrier between a cell and its outside environment. Gram-negative bacteria (so called because they don’t respond to the Gram stain) have a double membrane and include bacteria such as Escherichia coli (the microbiologist’s lab rat), Yersinia pestis (bubonic plague), and Pseudomonas aeruginosa (lung infections in cystic fibrosis patients). The outer membrane of Gram-negative bacteria forms a barrier that protects the cell from toxins and other harmful agents however vital nutrients still need to cross the outer membrane to get to the cell. The membrane proteins that facilitate nutrient transport across the outer membrane are known as porins. Shown here is the porin called outer membrane protein F (OmpF) from E. coli. OmpF is a general porin that will allow small (generally under 600 Da) water-soluble molecules to passively cross the outer membrane. Typically an E. coli will have about 100 000 OmpF molecules per cell. OmpF is a homotrimer with each monomer consisting of 16 β-strands that form a hollow cylindrical structure called a β-barrel (hence todays title). Molecules travel down the centre of each β-barrel where there is also a constriction loop (parts coloured orange) which reduces the size of the pore to 1.7 nm in diameter. The crystal structure of OmpF was first determined by S. Cowen and colleagues in 1992  and the structure shown is OmpF in the tetragonal crystal form  and has the PBD number 1OPF in the protein data bank. S.W. Cowen, T. Schirmer, G. Rummel, M. Steiert, R. Ghosh, R.A. Pauptit, J.N. 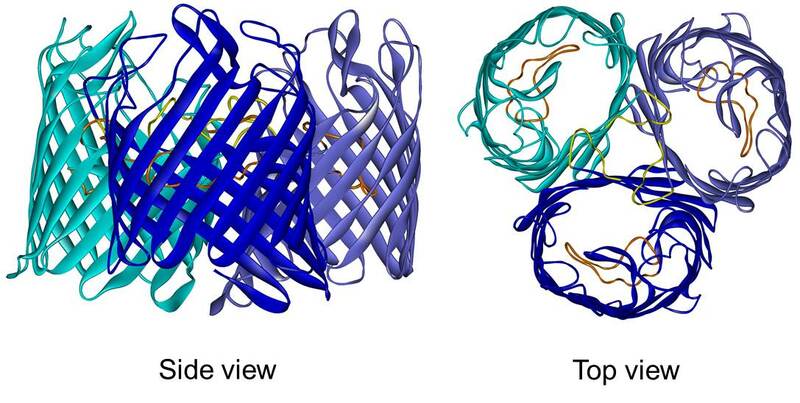 Jansonius, J.P. Rosenbush (1992) Crystal structures explain functional properties of two E. coli porins. Nature 358: 727-733. S.W. Cowen, R.M. Garavito, J.N. Jansonius, J.A. Jenkins, R. Karlsson, N. Konig, E.F. Pai, R.A. Pauptit, P.J. Rizkallah, J.P. Rosenbush, G. Rummel, T. Schirmer (1995) The structure of OmpF porin in a tetragonal crystal form. Structure 3: 1041-1050. Crystallographic representation generated with Diamond. When transition metals meet organic linkers (carboxylates, N-donors such as pyrazine, phosphonates, sulfonates), they can give rise to a 1D-, 2D- ou 3D- framework, namely MOFs for Metal Organic Frameworks or PCPs for Porous Coordination Polymers. Indeed, some Coordination Polymers don’t exhibit porosity. MOFs are crystalline materials and X-ray diffraction is a suitable tool to determine their structure. A majority of MOFs are based on divalent metal (M2+= Zn2+, Cu2+, Co2+, Ni2+, Mg2+, etc…) which gives rise to crystals big enough (from 0.1 to 0.2 millimetres) to be measured on single crystals X-ray diffractometer, a well-known and successful technique for structure determination. Nevertheless, growing single crystals from trivalent (M3+= Fe3+, Cr3+, Al3+, V3+, Ga3+, In3+, etc…) or tetravalent metals (M4+= Zr4+, Ti4+, Hf4+) is more challenging and scarce and lead often to a powder; Crystallographers must thus solve the structure from a powder diffraction pattern which contains much more less information than a single crystal diffractogramme. In addition, MOFs crystallinity can be really “bad” and synchrotron measurements are often needed for this technique. 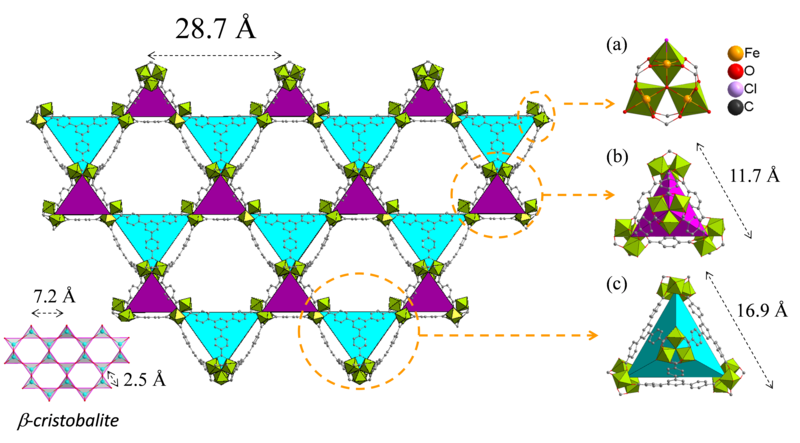 The MOF we’re talking about today MIL-143(Fe3+) (or Fe3O(Cl–)(H2O)2(bdc)3/2(btb).nsolv) was solved from powder diffraction data and crystallizes in the cubic F23 (n°196) space group (a=40.8635(1) Å). MIL stands for ‘Materials of Institute Lavoisier’ and this was the 143rd MOF they made. As there is no classification for MOFs, each lab names its baby after the lab’s name so we got some nice name such as HKUST (for instance HKUST-1), CAU, UMCM, UiO, STA, PCN, POST, MOM and so on. Nevertheless, one of the main issues with MOFs is their low chemical and thermal stability. A large amount of MOFs based on M2+ metals are not even stable to air moisture and must be kept in solvent or under inert atmosphere, making their industrial application difficult. By increasing the valence of the metal, one can increase their stability5 but it is not an absolute rule as others parameters can interfere such as the mesoporosity, i.e. containing pores with diameters above 20 Å (N.B: most of the MOF are microporous, i.e. below 20 Å). Indeed, MOFs exhibiting a mesoporosity tend to be more fragile, MIL-143 is one of them as its mesoporosity is only partially accessible. (1) Férey, G.; Mellot-Draznieks, C.; Serre, C.; Millange, F.; Dutour, J.; Surblé, S.; Margiolaki, I. Science 2005, 309, 2040. (2) Férey, G.; Serre, C.; Mellot-Draznieks, C.; Millange, F.; Surblé, S.; Dutour, J.; Margiolaki, I. Angew. Chem., Int. Ed. Engl. 2004, 43, 6296. (3) Chem. Soc. Rev. 2009, 38, 1203. (4) Chem. Rev. 2012, 112, 673. (5) Low, J. J.; Benin, A. I.; Jakubczak, P.; Abrahamian, J. F.; Faheem, S. A.; Willis, R. R. J. Am. Chem. Soc. 2009, 131, 15834. (6) Chevreau, H.; Devic, T.; Salles, F.; Maurin, G.; Stock, N.; Serre, C. Angew. Chem., Int. Ed. 2013, 52, 5056. Same… but different. The structure of beta – cristobalite. Basically, the a-cristobalite is stable at temperature below 270°C then above this temperature, the atoms re-arrange to give rise to the b-cristobalite, the symmetry of the solid changing from tetragonal to cubic. And the silica family does not stop here; there are 11 crystalline polymorphs, plus 2 amorphous (non-crystalline) polymorphs. One of them is particularly interesting: is Keatite, which does not exist in the nature, a pure synthetic SiO2 polymorphs. You can learn more at SiO2 polymorphs at http://www.quartzpage.de/gen_mod.html. The structure comes from a paper of Wyckoff Ralph W.G. published in the german journal for Crystallography, namely “Zeitschrift für Kristallographie”, in 1925.